The key elements of Zicom's Home Alarm System are the Main Panel, which is the brain of the system and the iAlert Station (CMS). Main Panel -The main panel is the brain of the system. It connects to the sensors installed at the Central Monitoring Station. When an incident occurs it gets information from the sensors and sends the same to i-alert 24X7 Service. Hooter - This is the alarm sounding device. It acts as a deterrent to whoever attempts to break -in. It is loud enough to be heard from the 7th floor of a building. Remote Control - Enables customers to arm and disarm the system using the remote control switch. A distress button also helps one to call for help in case of emergency. Magnetic Sensor -It is the ideal security system for doors/windows. It senses any break-in via doors / windows and sends a message to the main panel which in turn triggers the hooter and sends the same to CMS. 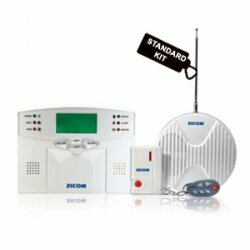 The iAlert 24x7 Service is the main hub, where well trained personnel monitor your alarm system and receive information from the main panel installed in your premises via phone line. In a case of an emergency like break-in or burglary in your premises, a signal is sent from your main panel to our i-Alert personnel at the monitoring station. On receiving the alert the service personnel calls the customer or a pre-notified number given by the customer. This service is active 24x7, 365 days to ensure your safety. In association with Royal Sundaram, "safe homes" gives you insurance cover.